Ravenstein is a village about 20 kilometres south-west of Nijmegen. 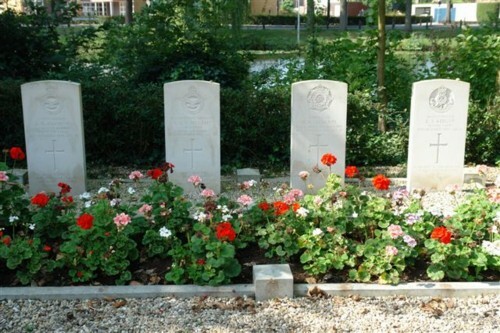 The cemetery is close to the windmill in the village, and the war graves will be found in a small enclosure in the south-west portion of the cemetery. 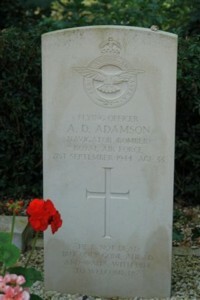 132834 Flying Officer Alexander Dalgety Adamson, Navigator (Bomber) in 190 Squadron, Royal Air Force Volunteer Reserve, died 21st September 1944, aged 33. Son of William Gilbert Don Adamson and of Elsie Mackay Adamson (nee Dalgety), of Forfar, Angus. 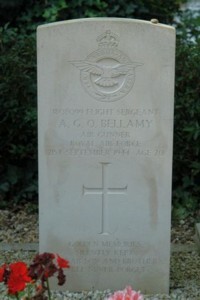 1808099 Flight Sergeant Arthur George Oliver Bellamy, Air Gunner in 190 Squadron, Royal Air Force Volunteer Reserve, died 21st September 1944, aged 20. Son of Oliver James Bellamy and Mabel Bellamy, of Chartham Hatch, Kent. 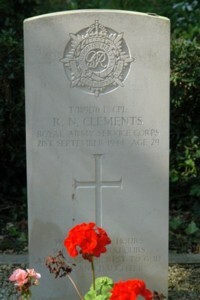 T/189176 Lance Corporal Ronald Nevison Clements, Royal Army Service Corps, died 21st September 1944. Son of Herbert Tindale Clements and Annie Clements; husband of Dorothy Alice Clements, of Wilmslow, Cheshire. 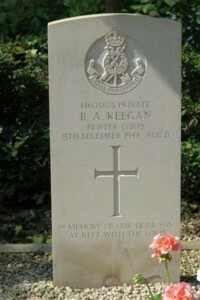 14603805 Private Bernard Allen Keegan, Pioneer Corps, died 15th December 1944, aged 21. Son of Mr. and Mrs. Joseph Henry Keegan, of Plymouth.